Posted by janina on September 19, 2009 at 12:07 pm. 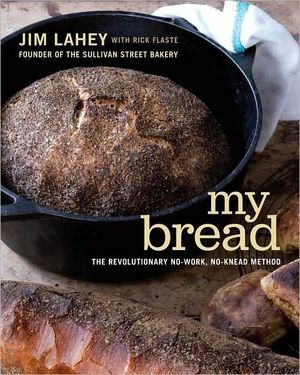 It is easy for me to recommend My Bread because I have been using Jim Lahey’s recipe for no knead bread ever since it was published in the New York Times almost 3 years ago. It is a flawlessly simple recipe as well as versatile. It is based on the idea that modern bread recipes are all about saving time, putting your own labor into the bread to get what would normally take a day in a matter of hours. Instead, Lahey’s method lets time and yeast do the work. I have recommended his basic recipe to countless friends and acquaintances, and rarely have been met with anything less than extreme enthusiasm. And let me just say. I am not a baker. I preserve, I cook, I make everything I can from scratch, from tomato sauce to pesto, to jams and pickles to yogurt and kombucha. But I very rarely bake. Cookies, cakes, pies, breads, unless it’s a casserole I usually leave it to my boyfriend, so it’s no surprise that he is the one who initially discovered this recipe; but over the years I have learned to love this one particular baking project, and to make it my own. It’s what I have always called a Fougasse (due to the shaping and haphazard baking method I use), and Jim Lahey has perfected into a Pizza Bianca. His book includes 40+ bread variations, recipes for sandwich ingredients from meats to spreads to vegetable preparation, recipes for his classic panini, and what to do with left over stale bread. In my eyes, this is the bread book to end all bread books. As part of my recommendation for this book, I’d like to share my enthusiasm for it’s publication by posting my adaptation for the Fougasse. Introduction: A Fougasse is a traditional French hearth bread shaped into an ear of wheat. A hearth bread, is a bread used to tell the temperature of an oven. They are simple breads that rarely fail, and can be cooked at a variety of temperatures, making them perfect finicky ovens and spacey bakers. The full time for this recipe from start to finish is anywhere from 6-18 hours depending on the weather. Most of this will be resting time, with only about 15-20 minutes for baking, and about 10 minutes of work. in a large bowl combine flour, yeast, sea salt, adding almost all of the water- reserve a little just in case the air is damp, and if you use it all and need a little more that’s okay too. It should be shaggy and sticky but not particularly wet or well formed. cover with plastic wrap until bubbles form along the surface, anywhere from 6-18 hours. SIDE NOTE: To give you an idea here, living in Philadelphia where we see some extremes from dry cold weather to damp hot weather, we would let the bread rest for around 18 hours in the dead of winter when we kept our house very cool and dry, and 6 hours in the middle of summer when it was extremely humid and our average house temperature was about 85-90. In my experience, during lesser extremes you usually end up waiting about 10-12 hours. when the top of the dough is flat and dappled with bubbles, dump it onto a well floured work surface and fold it over on itself twice, covering it again with the same piece of plastic, and let it rest 15 minutes. in the mean time, get out a baking sheet and line it with parchment, or oil a cookie sheet generously with olive oil.